I love mixed patterns. It is on-trend right now, is new and yet vintage in look while being classic in style. 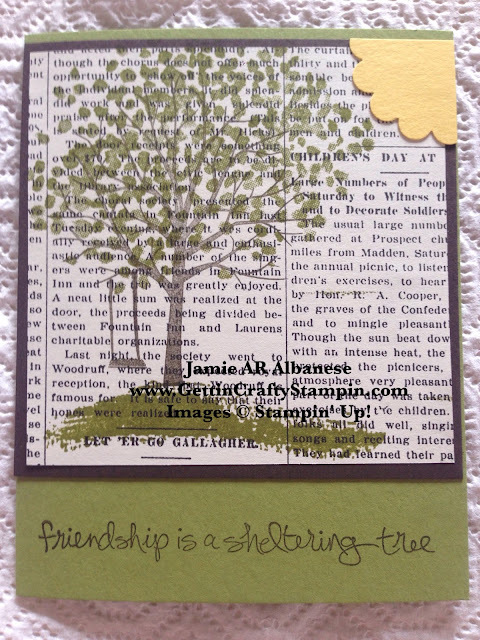 Here is a fun friendship card that embraces the new and the old. Created in a recent card making class, this hand-stamped card is perfect to celebrate the relationships in your life. Join us as we connect, create and yes, make friendships at our card making classes! It's true, isn't is... friendship is a sheltering tree. I'm blessed to have some amazing ladies in my life (near and far) who bless our lives. I love that this easy card is pretty and says it all simply. Using the Old Olive and Chocolate Chip inks to stamp directly on the pretty Typeset Specialty Designer Series Paper. 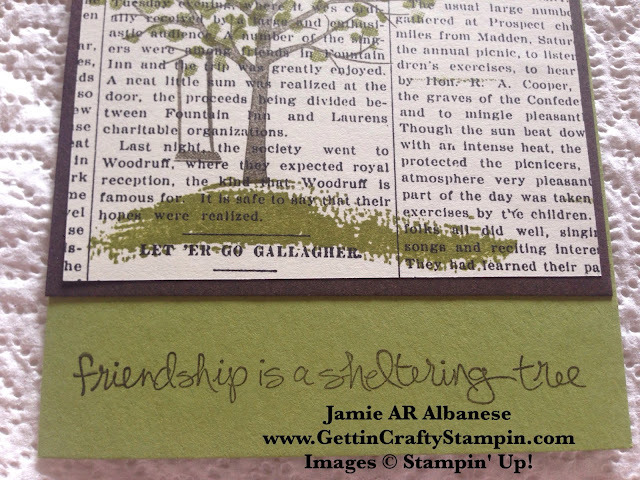 This Sheltering Tree stamp set is ideal for all seasons!! I adore it. Trimmed out with matching card stocks, this is an easy way to create an elegant card. Stamping the Chocolate Chip ink on the base of this card stock is a great cohesive look. The pop of sun and color of the punched with the 1-1/4" Scallop Circle Punch in Daffodil Delight is a fun and whimsical punch-art accent to this hand-crafted card. Deliver some smiles and love with a friendly hand-stamped card! This friendship card is a perfect cheer-up, thank-you or just-because card. Easy to create and cool with it's style and mixed media look - this would be a great way to show someone how special they are! Join us at our paper crafting classes and see what all the fun, crafting, connecting and friendships that come from the art of rubber stamping.